There was a time when I was a daily watch wearer. It was just a part of my wardrobe, a part of my skin. I felt a little naked without one. My watch was the first thing I put on in the morning, even before I got up out of bed. Maybe it was my glasses. But you get the idea. Here’s the thing: I can’t say that I was ever a fan of watches. It was more like I was a fan of wearing a watch. I just thought that was a thing that people were supposed to do. Getting my first watch was something of a right of passage. I had an unspoken image of manhood that included a job, a hat, a watch, and facial hair. It was okay to shave the facial hair. But you had to wrestle with it one way or the other. At 45 years old, that image has not changed at all for me. And yes, I deal with facial hair, I have a job, and I wear a hat, unlike all the un-hatted animals around me. However, the watch has been an on and off relationship. Before I had an iPhone, I wore one religiously. A couple of years into the iPhone, I stopped wearing a watch altogether. After all, the only thing a watch ever did was tell time. My phone was always near to hand. Knowing the time was no big deal. There was also the complexity of digital watches that just made me crazy. Even today, setting the average digital watch seems to require a nine-month certification course. You press the lower-left button twice, and hold for three seconds on the second press. Then press the top-left button once to change the hour. Anyone who has bought a digital watch in the last, ever, knows exactly what I’m talking about. Also, I never saw the point of spending more than $30 for a watch. I considered even that extravagant. I never saw the watch as a piece of jewelry, but as a necessary evil. Strictly utilitarian, I just needed something with big enough numbers for me to read easily. After a short time, the watch face would be scratched up beyond usefulness. And the watchband would need to be replaced. Good luck with that. Watches were horrible. I was glad to be shed of them. The beginning of the smartwatch market as we know it today did not start with Android Wear, Samsung Gear, or even the Pebble. All of those devices and ecosystems were inspired by Apple’s iPod Nano released in 2010. One of the most popular accessories for that device was a special case that allowed one to wear it on the wrist like a watch. Once people saw the nano with the included watch faces, in the imaginations of millions, the iWatch was born. Almost by accident, Apple prepared the smartwatch market long before they had a device to sell into it. From that moment, it was a race to see who would get there first. Pebble was the first mover into the freshly cultivated space. They quickly put out a product that was targeted for iPhone owners. They were trying to take advantage of iWatch fever before the iWatch hit. When Apple pulled the nano from the market, the hope of fans, and fears of competitors was that the iWatch was about to drop at any moment. Pebble may have started the desperate scramble, but others would soon follow. From that moment till September of 2014, every Apple announcement was thought to be the one that would finally reveal what everyone had dubbed the iWatch. Just before every Apple event, a competitor would announce their own smartwatch initiative. Samsung, the most desperate of them all, put out six smartwatches during that waiting period. Along the way, Google introduced their smartwatch platform, replete with partners and prototypes. Not to be outdone, Microsoft also threw their hat into the ring. They were all terrified of being iPhoned for a second time. When the iPhone landed, it took the industry by surprise. All of the major players in that space were unprepared. Late to respond, they are either dead or irrelevant. The current tech players didn’t want to lose the smartwatch game before it started. They knew better than to let Apple get there first, and define expectations. As a follower of tech, I have a sense of history with regard to the current smartwatch market. It has always been an iWatch market. Everything else has always been a placeholder for the real thing. I have not been remotely tempted by any of these placeholders. I have studied them from afar. But I have always been waiting to see what Apple would do in this space. They are the only company that had an idea about what a smartwatch should be. Everyone else has only one purpose for being: They just wanted to get there before Apple. To me, that is more than contemptible. Being who I am, it was almost a foregone conclusion that I would buy this watch. I was immediately disappointed with the announcement because I wanted blood pressure and blood glucose monitoring. I just had to come to terms with the fact that the tech wasn’t yet ready for prime time. Of the things Apple initially showed off, I was most impressed with the communications aspect of the device. I thought it would solve a particular problem I was having. I walk a lot, and I mean a lot. When walking, I don’t like having to pull out my iPhone do do basic things like send or read a text or see who’s calling. I felt like the Apple Watch could help me keep my phone in my pocket when it wasn’t convenient to interact with it. I ordered watches for the whole family when preorders went live, 2:00 a.m. CST. They arrived Friday evening. There would be no silly unboxing video. I wanted to get this thing on my wrist as soon as possible. And that is precisely what I did. I was both excited and disillusioned by the pairing process. It is very sci-fi futuristic in some ways. But the Apple Watch has the longest cold boot-up time of any device I have owned in quite a while. The second not of concern I had was the bewildering array of settings in the Apple Watch app on the iPhone. It is quite easy to get lost in that maze of options. Each one can have a profound effect on your experience with the watch. My experience took a further dip when I enabled the accessibility features (which I will outline in another post). Let me just say that there are some major bugs in VoiceOver, especially when used in conjunction with Zoom. My advice right now for those who need these features is choose one or the other, not both. Even so, be prepared for some things not to work as expected. Adding to my rapidly bursting bubble was the fact that the three Apple Watches in the house were not connecting to my wifi network, which is usually quite reliable throughout the house. It took days to sort that out. It was not necessarily the fault of the watches. If you have trouble with messages not being sent or received, the culprit is likely some setting in your home network. That will have to be sorted before your watch works perfectly. Tuesday morning, I decided to take the plunge an shower while wearing the watch. There didn’t seem to be a problem with standard operations. In fact, I was confident enough to tell people that it was perfectly safe to shower with the watch. It was about an hour later that I realized there was a problem. The speaker no longer worked at full capacity. That means that phone calls and audio messages were mostly inaudible. Since I occasionally used VoiceOver, a broken speaker was a deal breaker. I called Apple. We went through a lot of unnecessary tests before the rep concluded that the watch needed to be replaced. He said it would be at least a month before it could be repaired. At that point, I decided to just return it for a refund and repurchase it in June when there would be more stock. I was crestfallen. In my case, trying to keep a stiff upper lip did nothing to mask my despondence. Resolutely, I carefully re-boxed the item and set it aside, to be dropped off at the FedEx location near my office downtown. …And that is how we get to the beginning of this review. After a fitful sleep that night, I woke up with a new resolve. Broken or not, I was going to keep the watch. By that time, I had grown accustomed to its face, three of them, to be exact. I fell in love with three of the watch faces that I had spent some time customizing. The half-day I spent without my watch on my arm was painful. It wasn’t just that I missed wearing a watch. I missed wearing that particular watch. I had grown accustomed to it to the point where even with only partial functionality, I couldn’t see myself living happily without it. In the first crop of official reviews, there was a lot of focus on how one was expected to use the Apple Watch. There has been a lot of talk about what one actually does with a smartwatch. If there is only one piece of advice you take from this pice, let it be this: Don’t do anything with the Apple Watch beyond setting it up and putting it on your wrist. Do that. Forget about it. And go on about your day. 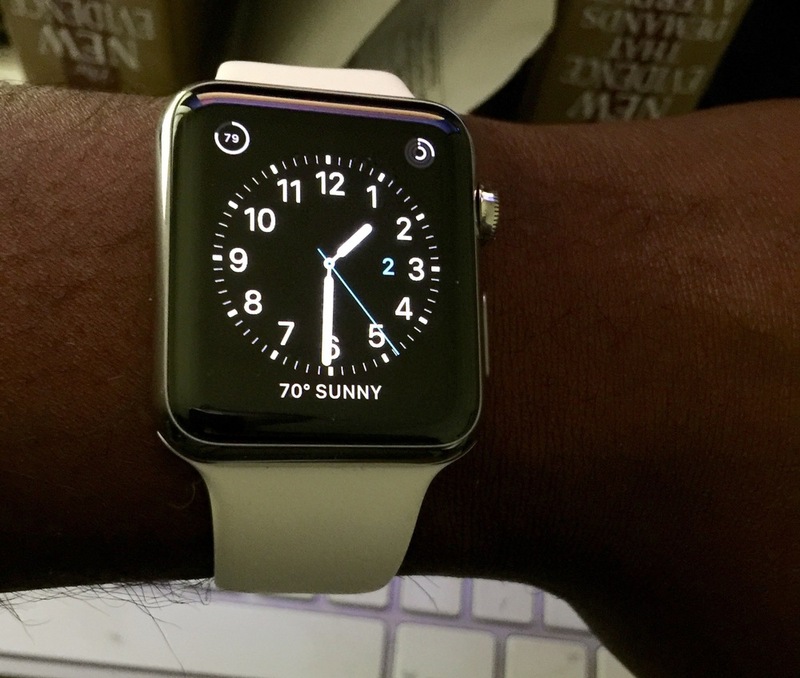 The Apple Watch is not a passive device waiting for your input. It is a proactive device. Throughout the day, it will notify you of things you need to know. It will let you know about your activity level, even tell you when you need to stand up a move around for a bit. It will show you your incoming mail, let you know when someone is trying to reach you by message or by phone. You can triage your messages and calls, and even close the loop, all on your wrist. Interaction with other devices not required. Beyond all the things it does without prompting from you,are the myriad of things you can initiate with the watch. You can compose and send a message, make a phone call, check your heart rate, start a workout session, check the weather, play some music, control your media, enjoy your photos, set alarms, timers, and stopwatches, and so much more… All of the things you see them do in the ads are real things, most of which, I have done just in the course of living my life while wearing the Apple Watch. Before writing this section, I stopped my podcast playback, set an open workout for an outdoor walk, and walked my dog for a half mile. Along the way, I sent a message, received a message, and took a quick call, all without needing to address my phone. I barely had to break my stride. …Oh… It also tells time. Speaking of time, I have grown quite accustomed to the highly customizable watch faces. Telling time is no longer merely utilitarian. But if utility is what you are after, there is plenty to be had in your choice of watch face. I especially love the Glances: a cross between the iOS dock, and Microsoft Live Tiles that, in virtual space, lives just beneath the clock face. More than any of that, I have grown accustomed to the look and feel of the watch: the physical device. I sprung for the stainless steel versions for both my wife and I. Okay, I stuck my father with the Sport. But he wouldn’t have been able to appreciate the difference. I can. And the difference is exactly what I hoped it would be. It does not matter to me that the average person will not be able to quickly tell that I sprung for something a bit more expensive. In the grand scheme of things, an extra $200 is not that big a deal. It is not about the extra money. It is about the extra sense of luxury conveyed by the subtile styling and material differences. It is about how it makes me feel, and not about how someone else feels about it. And it makes me feel like a million bucks. First out of the gate was Pebble. But what did they really bring to the table? Remember, at the time, what they were competing against was the iPod nano with a third-party band. The Pebble did not even attempt to reach that high. It was even uglier than a nano plus third-party band. Functionally, it was exactly what people expected an iWatch would be if Apple turned the nano into a watch. There was nothing original, or even interesting. But at least it was first. They did have one more thing to their credit. It was also cheap. To this day, their strategy has not changed that much. They still are the kings of cheap. They are still investing nothing in industrial design. However, they now offer one or two models that are intended to ape the look of Apple’s more expensive offerings. Before that, I found them uninteresting. Now, I find them despicable. Samsung Gear: Me Too, Me Too! Samsung was pathetic long before releasing the Gear watch. They were not interested in beating Pebble. Like Pebble, Samsung was only interested in getting out of the gate before Apple. They had nothing to copy. They only knew Apple was about to release a smartwatch. They had only rumors to go on. They built the watch rumors suggested that Apple was working on. In typical Samsung fashion, they had no idea what the product was supposed to be. So they threw everything at it they could fit into a wearable case. Despite their best efforts to “innovate” before Apple could get credit for launching the category, the products landed with a thud. Convinced that Apple would be launching any moment, Samsung would go on to release as many as six watches on the market at the same time, hoping agains hope that something would take hold. Nothing did. Google doesn’t design hardware. They build platforms for other hardware makers to adopt. None of the Android OEMs are particularly good at making software. They make hardware for other people’s software to run on. Simply put, they need Google to supply them with a pattern for their smartwatch efforts. That is the story of Google Wear. Up to that point, all smartwatch efforts were rectangles. That is what seemed to make the most sense for displaying text and lists. But traditional watches are usually round. Motorola figured they would make a smartwatch that looked like a traditional watch. Someone should probably tell Motorola that smartwatches are not mechanical watches, and should probably not look like them. However, Moto wanted to be first to the round smartwatch, so round, we go. But in a tribute to everything wrong with these beat Apple to market efforts, Motorola couldn’t be bothered to complete the circle. Their watch face stops short of 360. It is more like 300. It is flat at the bottom. They were in such a rush to market, they didn’t bother solving the challenge of making a round device with a thin bezel. They had only one thing to contribute to the conversation, and couldn’t be bothered to do that right. Again, I have nothing but contempt for these cynical efforts to beat Apple to market. It is worth noting that I am not alone. Sales of all of these products were dwarfed by one day of pre-orders of the Apple Watch. It is not late to market. It arrived right on time for the market it created in advance of its arrival. A not insignificant number of professional Apple Watch reviews noted that while the Apple Watch was a great product, it was not essential. From the first time I read that sentiment in a headline, I saw it as perhaps the most ludicrous metric of value I have ever seen for any consumer electronics product. My laptop is not essential. My tablet is not essential. My smartphone is not essential. Even my desktop is not essential. Neither my TV, microwave oven, nor central heat and air conditioning are essential. Just ask the billions of people all over the world who have none of these things, and less. Even if you were to label a watch as essential, anything you pay above $10, is for unessentials. Beyond that point, it is all about luxury and preference. You are paying for the color, style, materials, craftsmanship, bands and bracelets, brand name, and a thousand little thoughtful touches that add up to something that makes you feel special when you use it. That’s what you’re paying for. That’s what you’re always paying for. And those little touches of luxury abound throughout the Apple Watch. The band-swapping mechanism is brilliant. The closures are well-considered. The Digital Crown develops tension as it approaches the top or bottom of a list. The animations draw you in. The sounds help tie it all together. The tap on the wrist is not like the vibration that comes from an off-the-shelf parts emporium. Speaking of which, every part of this watch was designed by Apple. They didn’t just go out and pick up Intel’s latest micro-processor. From the aluminum to the gold, Apple formulated their own alloys. The same attention to detail went into their bands and bracelets. The link bracelet takes nine hours to make. That’s nine hours for one link bracelet. Even the watch faces got the same treatment. The butterflies are from thousands of photographs of actual butterflies. The jelly fish were filmed in specially built aquariums. The blooming flowers are time-lapse images of flowers actually blooming. At each of these luxury touch-points, Apple stands alone in the industry. It never even occurs to any other company to do this stuff. Pretending the likes of Pebble and Android Wear offerings are in the same class of product is obscene. I do not focus on software bugs for this, or any product. Were I so inclined, I could fill these pages with show-stopping bugs in all of the competing products. Bugs are not what makes those products inferior. Bugs can be fixed. The Apple Watch certainly has its share of them, but not so many as one might expect from a gen one product. There are no bugs that keep you from fully enjoying what this product has to offer. Will version two be better? Of coarse it will. How could it not? But version one does all that it promises. There are delights aplenty to be found, here. When I woke up resolved to keep my watch even with a busted speaker, I knew that there were still enough delights to justify the decision. I had grown too accustomed to it to easily give it up. I re-paired it to my phone, restored it from backup, and turned it on. The speaker was working perfectly. As it happened, it just needed to completely dry out. The speaker was never busted. There was just water blocking the path of the sound. Completely dry, it functioned as new. That said, if you submerge your watch and the sound is lost, give it a good ten hours to completely dry, perhaps more. Now that I have everything dialed in, as it were, I am routinely going to bed with over 50% battery life. Under normal, daily use, battery life is simply a non-issue, as other reviewers have consistently stated. Is it worth the asking price? That is entirely up to you. Until now, I didn’t see the point of paying $600 for something called a watch. Now, I am buying extra bands that are five times more than I previously paid for a whole watch. The value proposition has changed because of what this product does for me. I cannot say what it will do for you. But I can’t imagine you owning it, and failing to find value in the most personal product Apple has made to date. What you do with it when it is on is not nearly as telling as how difficult it will be for you to willingly take it off and ignore it.